Aligning your business with Greater Mankato Growth through our menu of marketing opportunities positions you to engage with close to 1,000 businesses and thousands of people in the Greater Mankato region. Whether an ad in eNews or a top-level sponsorship - we offer a variety of opportunities to fit all types of businesses. Your investment not only helps to advance your business but also supports our many facets of work, from hosting high-profile events to linking businesses with critical resources and information (to name a few). Sign up online for the opportunities you want. After you have signed up for an opportunity, you will receive an email letting you know that the opportunity is either “confirmed” or “in queue” for a drawing of all eligible sign-ups. If you have questions or need your business username, please contact us at 507.385.6640. **If you are experiencing issues with registration while using Microsoft Edge please try using an alternate browser such as Firefox, Chrome or Internet Explorer. If you continue to experience problems registering, please contact info@greatermankato.com or 507.385.6640. NOTE: Registrations and payments for all marketing opportunities are final. Some Marketing Opportunities are limited. 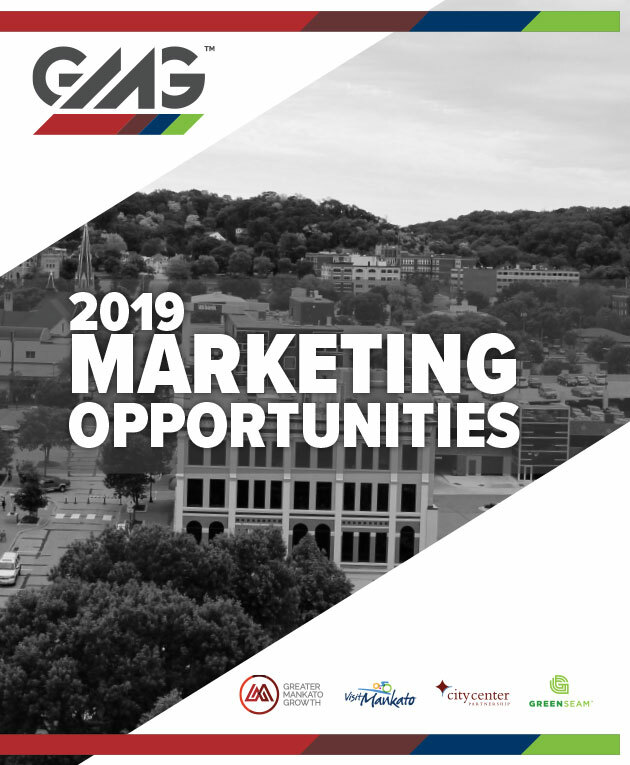 2019 agreements submitted online through November 1, 2018: Members who sign up by this date have the best chance of getting the 2019 marketing opportunities they want. All online sign-ups will be collected through midnight November 1, with a drawing held for those marketing opportunities where demand exceeds supply. Confirmations of the opportunities each business has committed to will be sent out in early November. 2019 agreements submitted November 2, 2018 and after: All remaining marketing opportunities as of this date will be available on a first come, first serve basis. The marketing opportunities site will be updated continuously throughout the year, so you will always know what opportunities may still be available. All Greater Mankato Growth members are eligible to sign up for the following advertising opportunities unless otherwise noted. Promote your business and special offers in the Member-2-Member section of Greater Mankato Growth eNews, emailed every Tuesday to 2,300+ business representatives. The annual average Open Rate of our weekly eNews is 31% (which is higher than industry standard)! *Limit of three (3) consecutive ads (i.e. if a member has three consecutive ads, there must be a break in subsequent enews before the next ad runs). One image can be submitted with your ad. Please see specs here. Purchase an up-to-date list with mailing addresses of all current member businesses or representatives. Good for one use only. Prior approval of item being mailed is required. Our Greater Mankato Growth Online Business Directory is featured throughout our website. Note: Our directory page gets approximately 25 page views per day. Businesses in the Greater Mankato region are listed in our online business directory. Only Greater Mankato Growth member listings are “clickable” – with a link to your customized business page. Your membership level will determine your type and number of listings. See your membership description for more information. Reach the target you want online with electronic coupons and offers - best of all, this feature is included for FREE in your membership. Add coupons with our easy online coupon generator, with coupons being featured on the Greater Mankato website. Login to the member portal of our website to add your coupons or special offers. Greater Mankato Growth members can post their relevant business news directly to our website! By sharing and aggregating news stories from businesses we lift up the visibility and awareness of a diverse scope of sectors, therefore, giving the public a broader scope of the successes and advancements region-wide. Employee news would include new hires, promotions, individual recognition, awards and certificates, etc. Press Releases would include official news regarding the business or organization as a whole, company-wide news, etc. Have an important message to share with the local business community? Greater Mankato Growth accepts guest blog posts from our members, to be posted at greatermankatoblog.com. Our blog garners approximately 1,200 page views per month. The topics considered might be based on (but not necessarily limited to) critical business information, current events and/or hot marketplace topics. Send us your ~500-word post and suggested tags for consideration. We reserve the right to refuse any post. 23,000 Guides to Visiting and Living in Greater Mankato will be published 2019 and distributed to visitors and relocating residents. Greater Mankato Growth members receive 10% off advertising in the guide. Please contact Steve Jameson (sjameson@mankatofreepress.com) at The Free Press to find out more and sign up. First come, first served to get on the schedule for shooting – only 12 openings! These events and programs are the perfect opportunities to market your business to an audience that is comprised of fellow businesses and their professionals. The opportunity to purchase these sponsorships are open to Engaged level and higher members of Greater Mankato Growth unless otherwise noted. Opportunities range from hosting a single event to being the presenting sponsor for a yearly program, there are opportunities to fit all needs. This professional development program for young professionals age 21-40 holds at least two events monthly. Sponsorship of the Greater Mankato Young Professionals (YP) program gets your business noticed by the more than 225 individuals in the program, as well as thousands of others interested in developing, retaining and connecting talent in our community. Reach our area’s current and emerging leaders by sponsoring this program that has been providing comprehensive leadership training with a personal, professional and community focus for the past 35 years. This program runs from September - May each year. Join us for the business event of the year as we launch a completely redesigned Annual Meeting. This event brings together the business community along with Greater Mankato Growth, Visit Mankato, City Center Partnership and GreenSeam to share the accomplishments of the current year and celebrate the vision for the future. Join us as we raise a glass to the companies, organizations and volunteers who partner with us to help our community thrive and hear from a high-profile keynote speaker. The event will be held in March and will be an evening event with an annual meeting preceding a social and sit-down dinner. AUDIENCE: Members, their employees, clients, friends and family. These events and programs are organized by Greater Mankato Growth and are open to the public to attend and participate. Opportunities to sponsor these events and programs are open to Engaged Members and higher. Agriculture producers, Agribusiness Leaders, Elected Officials, Community Leaders, Main Street Businesses are invited to a discussion. Agriculture leaders will offer their perspective on the Truth About Food. All businesses are eligible for any Visit Mankato and/or City Center Partnership Event or Program. Greater Mankato Growth members will receive priority preference as well as receive a discount where noted. The Mankato Marathon brings out 8,000-10,000 people for the weekend event. Each year continues to grow in runners, spectators and excitement. In 2019 the community will celebrate the 10th annual Mankato Marathon. The ranges below represent several “a la carte” options within each level. Contact Visit Mankato for more information at 507.385.6663 or email Joy Leafblad at jleafblad@visitmankatomn.com. Other Opportunities Include: Sport & Health Expo Exhibitor and Goodie Table. The City Center Partnership and Minnesota State University, Mankato Athletics team up to host a pre-game celebration in City Center Mankato to kick off the 2018-2019 Maverick hockey season. The event includes live music, mechanical bull rides, a performance by the Cheer Band, fun kids activities, food and drinks. Contact the City Center Partnership with questions at info@citycentermankato.com or 507.388.1062. The deadline to sign up as a sponsor is AUGUST 1, 2019. View event webpage.